Quality One Roofing, Inc is a locally owned and operated business servicing the New Jersey and Pennsylvania area for the past 20 years. Our company has been servicing the needs of contractors, commercial, and residential clients for roofing and siding, trim, gutters, and corresponding repairs. We understand that the key to continuing business with new and existing customers, top-quality workmanship and customer service needs to be at the forefront. Quality One Roofing, Inc is certified for all roofing projects on residential homes or large commercial properties. In fact, all of our employees undergo annual trainings and certifications to ensure that we provide our customers the highest level of craftsmanship. We are a certified installer with GAF and CertainTeed as a residential installer. 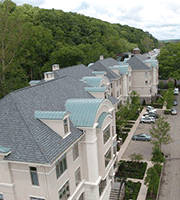 Commercially, we are certified with Versico, GenFlex and GAF (single ply roof systems). Furthermore, we can provide NDL (No Dollar Limit) and manufacturer’s warranties for commercial properties. You can rest assured in partnering with Quality One Roofing, Inc. Our stellar reputation as masters of our trade is showcased as many of our jobs come from referrals from contractors, friends, neighbors, and previous customers. Contact Quality One Roofing, Inc for a free estimate today!